I was this Spotted Lanternfly (Lycorma deliculata) Pest Alert at a Pennsylvania rest stop coming back from Cleveland this past summer. These insects, an invasive species in the U.S., have become quite a problem in Pennsylvania. 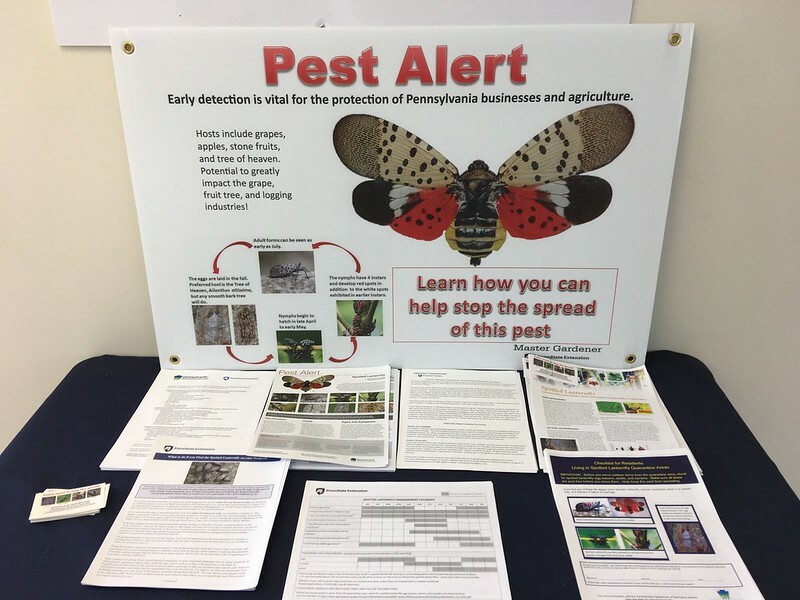 Spotted Lanternfly news for the week ending 10/13/2018. Just in time for Christmas: Now there’s a Christmas tree-infesting bug that hatches eggs inside your house. NJ.com. 10/14/2018. Gardening: a new fall task — the spotted lanternfly. Mcall.com. 10/11/2018. The Spotted Lanternfly aka Lycorma delicata has invaded NJ. Previously it had invaded Pennsylvania. Looks like there are two varieties. GENERAL CATALOGUE OF THE HEMIPTERA, W. E. CHINA, General Editor, H. M. PARSHLEY, Managing Editor FASCICLE IV FULGOROIDEA PART 9 FULGORIDAE , Z. P. METCALF, College of Agriculture and Engineering of the University of North Carolina. Link. 1898 Lycorma delicatula Horvith, Reise des Grafen B61a Szechenyi in Ostasien 2: 554. [Notes. ]* Equals Aphana delicatula White. 1900 Lycorma de icatula Matsumura, Ent. Nachr. 26: 206 (2). [Listed.] 1 * Equals A phaena operosa Walk. Equals Aphaena delicatula WTiite. 1906 Lycorma delicatula Distant, Fauna of British India 3: 207. [Described, comparative note. ]*’ 7 Equals Aphaena [delicatula White]. Equals Aphaena operosa Walk. 1907 Lycorma delicatula Oshanin, Ann. Mus. Zool. St Petersburg 12: 224. [Cata- logue. ]* *’ 7 ‘ 8 ‘* Equals Aphaena delicatula White. Equals Aphaena operosa Walk. 1912 Lycorma delicatula Oshanin, Katalog Palaarktischen Hemipteren 1912: 114- [Listed. ]*’*’* Equals [ Lycorma j operosa Walk. 1862 Aphaena operosa Stal, Ofv. Svenska Vet. Akad. Forh. 19: 485. To China 8 Aphaena ddicatula White. 1885 Aphaena operosa Atkinson, Jour. Asiatic Soc. Bengal 54: 150. To Lycorma ddicatula White. 1900 Aphaena operosa Matsumura, Ent. Nachr. 26: 206 (2). To Lycorma ddicatula White. 1906 Aphaena operosa Distant, Fauna of British India 3: 207. To Lycorma ddicatula White. 1907 Aphaena operosa Oshanin, Ann. Mus. Zool. St. Petersburg 12: 224. To Lycorma ddicatula White. 1912 [ Lycorma ] operosa Oshanin, Katalog Palaarktischen Hemiptera 1912: 114. To Lycorma ddicatula White. Here’s a screen capture form The fauna of British India, including Ceylon and Burma … ed. by W.T. Blanford.. Sorry no text — the OCR was a bit messy.